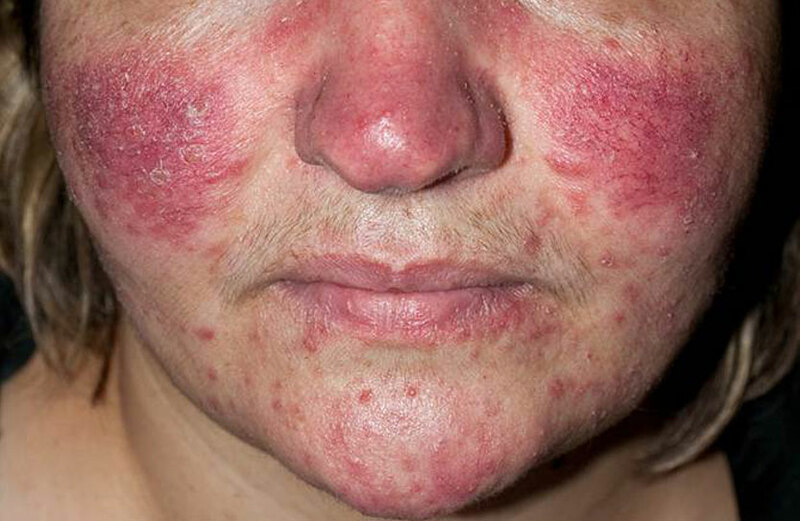 Rosacea is a common chronic skin condition that tends to affect the cheeks, forehead, chin and nose. Rosacea usually starts with a tendency to blush easily. After a while, the central areas of the face become a permanent deeper shade of red, with small dilated blood vessels, bumps and pus-filled spots similar to those seen in acne. Occasionally, there may be some swelling of the facial skin (lymphoedema), especially around the eyes. Occasionally, an overgrowth of the oil-secreting glands on the nose may cause the nose to become enlarged, bulbous and red (called rhinophyma). There may also be uncomfortable inflammation of the surface of the eyes and eyelids. There are a variety of triggers that may make rosacea worse. These include alcohol, exercise, heat, hot drinks, spicy foods and stress. Rosacea can be sun sensitive and most of our patients complain of debilitating and embarrassing flushing. Furthermore, the skin of the face is often sensitive, and the affected area can feel very hot or sting. Because of this, topical treatments can be very challenging and uncomfortable for rosacea patients and the dermatology and laser team at Atlantic Dermatology and Laser have worked hard to find treatment protocols which are both gentle and effective. These include innovative topical mixtures containing brominidine, ivermectin and niacinamide amongst others as well as customised laser protocols. Systemic treatments will be considered in more severe cases and the microbiome of the gut will also be assessed and optimised. We understand the frustrations of living with a “red face” and all that comes with it and will work closely with you to formulate the most optimal treatment plan.